It's actually December, and if it wasn't for the calendar saying it is, I would never think it was. It's not cold! There are leaves on the trees! The sun is warm! It's like September in my head. I mean, how September feels in Norway. I am used to winter. Cold days. Short days, as in days where it gets dark so early, and light so late. Some snow. Lots of inside-time. And somehow, with all this the Christimas spirit usually arrives magically with no extra effort. By mid November I am usually putting on Christmas music, starting to think about Christmas presents and Christmas decorations. But it's like my head can't quite get the calendar to fit the circumstances. So in my head, with this weather and temperatures, there's no room for Christmas spirit. That's why a friend and I have treated ourselves to a little trip to foreign lands to search for some Christimas spirit, and we are now in a country I have never been: Switzerland! 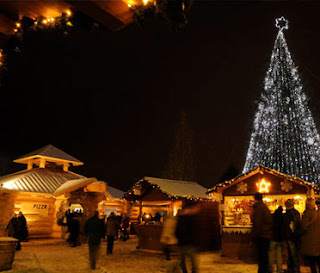 I have heard they have wonderful Christmas markets, and that they have mulled wine. I am anxious to see if it's anything close to Gløgg, cause that would just make it perfect! And for the chocoholic that I am, I am sure I won't be dissapointed wallowing myself in all that Swiss chocolate. I am ready to start exploring! Have a lovely weekend everyone! Christmas in Switzerland would be magical! Hi there! Hittade till din blogg via Expat! Kul i jul! Here i Greece it's the same thing, but after 25 years I'm used! Hope you'll have a wonderful vacation in Switzerland! -Eva, hei- så hyggelig :) Takk takk!